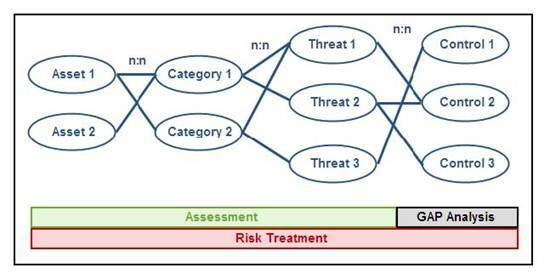 The following abstract diagram shows the relationship between the Assets, Categories, Threats and Controls. Additionally the figure shows the scope of each of the three core processes in relation to the aforementioned entities. It should be noted that the relationship on every level is n:n meaning that every asset can have many categories, but every category can be in more than one asset. One consequence of the repeated n:n relationships demonstrated in the figure is that, should a table list all possible connections then it would have several thousand lines. This is one of the reason why in the management tab of the risk treatment window the aforementioned information is represented in two tables. The following image shows an abstract diagram of the relationship between the three core processes and entities of RM Studio. 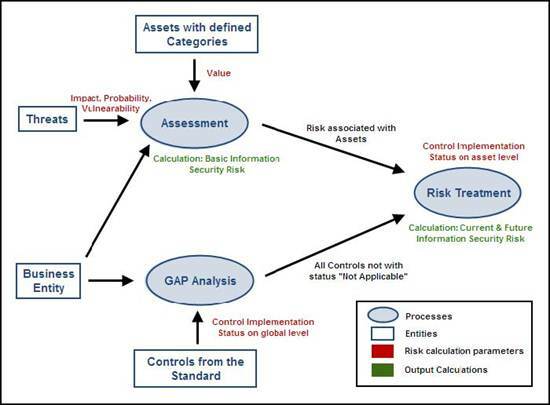 It can be clearly seen that the Risk Treatment uses information from both the Assessment and the GAP Analysis (which is optional). It should also be noted that the GAP Analysis; is independent from the Assessment , and it has no association with the Threats nor the Assets and is therefore a global Process.